Pre-engineered fire suppression systems provide immediate response to fire during those initial critical minutes. 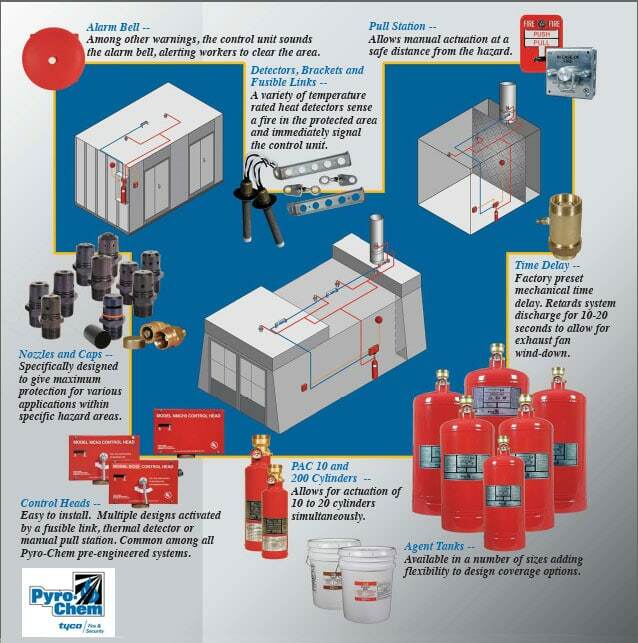 Dry chemical fire suppression systems use dry chemical compounds that suppress fire effectively and provide efficient coverage, are easy to install and maintain in any industrial setting. They require recharging after operation. Dry chemical agents come in ABC or BC. In applications where a dedicated water supply is not available, dry chemical is an easy, affordable alternative to water and some other agents. Dry chemical systems must comply with NFPA 15, Standard for Dry Chemical Extinguishing Systems, and NFPA 33, Standards for Spray Application Using Flammable and Combustible Materials and also tested to the criteria of UL 1254, Standard for Pre-Engineered Dry Chemical Extinguishing System Units. A wet agent system is an effective way for suppressing commercial cooking fires before major damage occurs. When a wet chemical agent is applied in a concentrated liquid spray to a burning surface, it reacts quickly with the cooking media (fats or oils) to produce a foam blanket covering the surface. This reaction, combined with the cooling effect of the wet chemical agent, also reduces the possibility of fire re-flash. Wet Chemical Systems must comply with the NFPA 17a, Standard for Wet Chemical Extinguishing Systems, and NFPA 96, Standard for Ventilation Control and Fire Protection for Commercial Cooking Operations, and also be tested and listed to ANSI/UL 300 Standard for Fire Testing of Fire Extinguishing Systems for Protection of Commercial Cooking Equipment. Make sure inspection tag and maintenance report is up to date. All hazards are properly covered with correct nozzles. Duct and plenum covered with correct nozzles. Check positioning on all nozzles. System installed in accordance with MFG UL listing. Penetrations sealed with weld or UL listed device. Check if seals are intact, evidence or tampering. If system has been discharged, report same. Pressure gauge in proper range (if applicable). Proper nozzle covers in place. Piping and conduit securely bracketed. Proper separation between fryers and flame. Proper clearance from flame to filters. Exhaust fan in operating order. All filters are in place. Manual and remote set/seals intact. System protective hardware covers in place. Fan warning sign on hood. Portable extinguishers available, accessible, and properly serviced. Class K portable extinguisher in place (if required). Make sure inspection tag is current. Make sure there is no obvious mechanical damage to cylinder piping or nozzles. Check positioning of all nozzles. Check if tamper seals are intact, any evidence of tampering. If system has been discharged, report. Portable extinguishers available, accessible, and operational. Ensure manual pull-stations are labeled and accessible. Additional service and maintenance is required in accordance with manufacturers’ listed instruction manual.